The successful launch of the Geosynchronous Satellite Launch Vehicle (GSLV) on September 8, 2016 by Indian Space Research Organisation (ISRO) marks an important milestone in India's space journey - to be fully capable of launching heavier satellites. It was the seventh successful launch from the Satish Dhawan Space Station at Sriharikota, third consecutive flight of indigenously built rocket, and the first one which has been officially described as 'operational'. Earlier flights were called 'developmental' flights. GSLV Mark II propelled an advanced weather satellite called INSAT - 3DR which weighs around 2,211 kg. ISRO is now working on GSLV Mark III which will be able to launch satellites weighing up to 4 tons. It will also be used to launch India's next lunar mission - Chandrayaan 2. Indian is already using the Polar Satellite Launch Vehicle (PSLV) as a commercial launcher, which can launch satellites that weigh less than 2 tons. 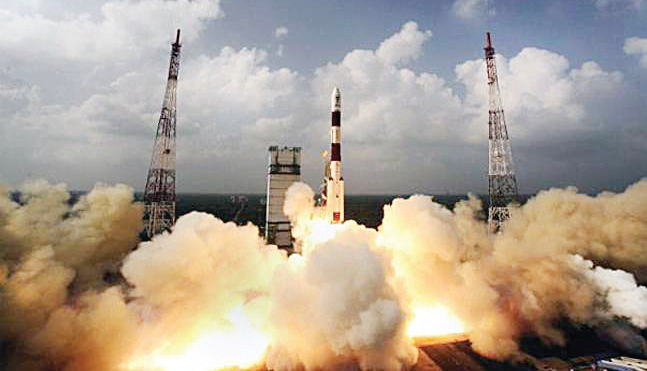 PSLV has already seen more than 30 successful launches consecutively. There have been just ten launches of GSLV yet - six with Russian cryogenic engines, and four with indigenously developed cryogenic engines. Out of these, only four have been successful while one was partially successful. Cryogenic propulsion of rockets is technically challenging but strategically quite important. It allows rockets to carry heavier payloads into space more efficiently. It is the key to the success of any robust space programme and in making a space agency a commercial player. Very few countries possess this critical engine technology. India's space programme has emerged as the most cost-effective one in the world. ISRO has formal agreements with 33 countries and three multinational bodies to help with its space projects, and has about 30 spacecrafts placed in different orbital paths. Besides, it has launched as many as 51 satellites for 20 countries to date and is rapidly emerging as the world's launch pad. ISRO has a constellation of ten earth observation satellites, nine communication satellites, one meteorological satellite, and one scientific satellite to its name. As a leader in the development of cutting-edge technologies and interplanetary exploratory missions, it is planning several more operational missions and making its mark in areas like satellite navigation. Ever since India sent a spacecraft to Mars in 2014, India has earned its place in the top-ranking space-faring nations (which include the US, Europe, Russia, China and Japan). The space sector in India can broadly be categorized into upstream and downstream industries. Upstream industries include manufacturing of satellites, their parts and subsystems, and launch vehicles. Downstream industries include satellite-based services, such as satellite TV, communications, imagery etc. In India, right now, only government entities have a hold over the space sector. The commercial industries merely supply parts and components or manufacture subsystems for the satellites. Some of them use government’s space infrastructure to provide services to their consumers. In advanced space-faring nations, many of these blocks have already been deregulated and privatized to create a value chain and make a major contribution to the economy. Now that the government is promoting private investments in the space sector thoughts its ‘Make in India’ program, there are high chances that a private space industry ecosystem may come up in India too. *Reversing the brain-drain from India. The global space industry was valued at $314.17 billion in 2013. Though India's space sector is dominated by ISRO (which works directly under the Prime Minister's Office), experts believe that the country is poised to be a key centre of space activity in the near future for pioneering cost-effective, efficient and innovative technologies. *A small satellite developer Dhruva Space joined hands with a German company called the Berlin Space Technologies last year to establish India's first factory to manufacture satellites for non-telecom commercial applications such as disaster management, vehicle and flight tracking, predictive analytics and imaging. It aims to manufacture 10 to 12 satellites every year. *Team India, an aerospace startup, won $1 million prize in the Google Lunar XPrize competition in the 'Landing Milestone' category. It was the only Indian team to compete in the competition where different teams had to land a robot on the moon by December 2016. *Aniara Space signed a satellite procurement agreement with the UK's Dauria Aerospace in July 2014 to develop two small geostationary communication satellites for broadcasters. *Earth2Orbit is India's first private space startup that offers earth observation products and launch facilitation services to different companies. Experts say that India has the benefit of having experience in design-oriented manufacturing, aerospace, and embedded software - which places it in a good position to emerge as a global hub of private space industries. On June 22, 2016, India put 20 satellites into Earth's orbit (which included 17 foreign satellites) - a record for ISRO which placed it after Russia (which deployed 33 satellites at once in 2014) and the US (which deployed 29 satellites at once in 2013). Global space agencies are facing tough competition from private companies who are automating the production of satellites, and using unmanned re-usable rockets to bring down the cost and time of manufacturing and launching of satellites. Dhruva Space, for example, estimates that it can manufacture a satellite weighing 10 to 100 kg for just Rs 3 crore. ISRO spends about Rs 200 to 300 crore to develop such a satellite. It is also in the process of forging partnerships with taxi aggregators, IT giants, and big data companies that are looking for satellites to help with their civilian and commercial ventures. Low production cost in the domestic market is an advantage for Indian space startups looking forward to enter into more lucrative overseas markets. To actively promote India's private space industry which is in its nascent stage, the government is in the process of forming a national legislative framework and a central space policy to enable public-private partnerships, allow private activity, reduce risks and have a provision for insurance as per the Outer Space Treaty to which India is a signatory. Space efforts of India are not without its problems. While the US is pushing to expand cooperation with India's space sector, the private US space companies have been opposing the use of low-cost ISRO launch vehicles for putting American satellites into orbits. According to them, it would be difficult for them to compete against ISRO as it is subsidised by the Indian government. Debris from an Indian satellite falling back to earth from orbit landed in a Japanese fishing village, and triggered an international dispute. India would have to pay for the damages as determined by the 1972 Convention on International Liability for Damage Caused by Space Objects. The absence of the national space law and policy means that India finds it hard to determine the quantum of damages it has to pay. Currently, India's space activities are majorly guided by the Satellite Communications Policy of 2000 and the revised Remote Sensing Data Policy of 2011. Realising the flaw in the system, New Delhi has finally decided to craft its own Space act which would help the government deal with legal issues arising from objects we put in space, and things that may happen to them or because of them. How is Space Industry changing in India? In the last two years, India's spaceship reached planet Mars, a mini space shuttle has been launched successfully, and ISRO kickstarted the classic swadeshi satellite based navigation system. By the end of this year, ISRO is going to launch a unique South Asia Satellite (as conceived by Prime Minister Narendra Modi himself) which is a friendly communications satellite for the South Asian neighbours. India has also launched its first state observatory - AstroSAT. New Delhi is gearing up to use space-based technologies in day-to-day governance of India. ISRO's NAVIC (Navigation with Indian Constellation) has seven satellites in orbit which provides day and night coverage of the navigation signals throughout the Indian region. ISRO missions and space technology have several other applications too, such as communication, broadcasting, meteorology, oceanography, survey of natural resources, monitoring environment, and predicting disasters. There has been a major shift in India's defence policy too and control of space has been highlighted as one of the critical areas of security after air, land and sea. Now that the Indian space programme is maturing, most top-tier colleges (IITs) are involved in cutting-edge research along with DRDO, HAL and ISRO. As more companies establish and expand their engineering centres in India, opportunities in the space industry will definitely increase.